To compensate for the decline in its endogenous production, glutathione is now available in its reduced form, which is to say its most active antioxidant form, as a nutritional supplement. When it reacts with free radicals, reduced glutathione (GSH) is converted into its oxidised form (GSSG). 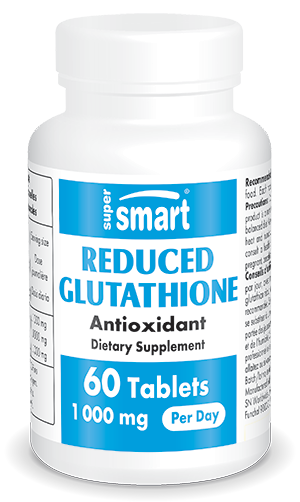 Glutathione’s antioxidant benefits can now be obtained with this dietary supplement which contains 500mg of GSH, with a suggested dose of one to two capsules a day. It is best taken with food and combined with other natural antioxidants in order to prolong its protective effects. Reduced glutathione’s detoxifying activity can also be boosted by combining it with DMSA, a powerful heavy metal chelator. To optimise the effects of this potent antioxidant, there is also a sublingual GSH supplement which is placed under the tongue for optimal absorption. Endogenous glutathione synthesis can also be stimulated by taking N-acetyl-cysteine and L-glutamine, two precursors of glutathione.